Congratulations to everyone who entered the FlyLife TopShot Photo Competition 2019. Our judges enjoyed experiencing your photography and the associated fly fishing experiences. 6 finalists were selected from a collection of high quality entries. The judges then deliberated over the best images from the 6 finalists according to the judging criteria. This photograph was taken while out fly fishing the Rubicon River, my mate and I both 20 years old have a passion for fly fishing that exceeds all else, wanting to be out in nature catching fish more than anything else in the world. This was taken early one morning before the sun started to hit the river, ‘Leroy’s’ hands dirty from the trek along the river and delicately tying a nymph. Absolutely stunning brown trout with sunrise. There was a sea run Brown trout in the area…, and sometimes they go up feeding in the surface for something…, standing still and look for the next rise. 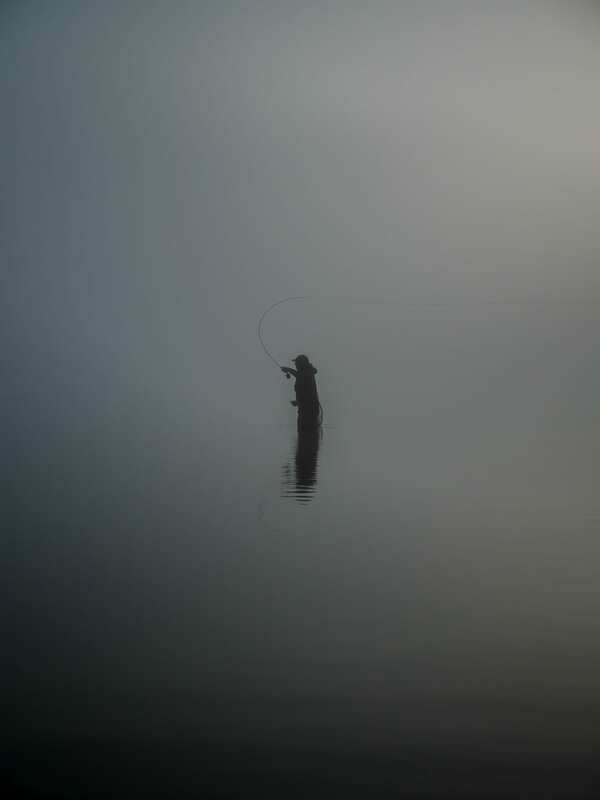 Peter de Boer punches a line to a distant tailing brown in the early morning mist on Lake Otamangakau, Central North Island, New Zealand. Willow grub madness. Fantastic day on the river with Matilda. It always nice to keep the fish in the water while taking pictures. Split shots are the right way how to combine two main subjects – fish x flyfisher. 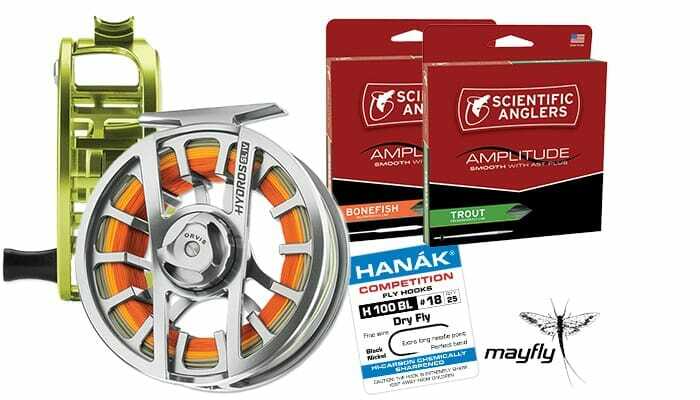 Our sponsors Mayfly Tackle, Stonefly Lodge New Zealand and FlyLife are putting up some fantastic prizes. Orvis Ultralight Waders Remarkably lightweight, no compromise in durability. 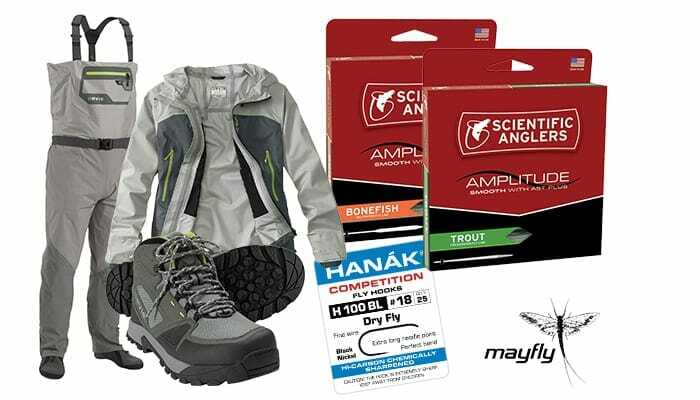 Prize includes complete system of waders, wading boots and jacket to suit winners sizing. Featuring the revolutionary AST Plus slickness additive for superior shooting ability and increased durability. Luxury accommodation, central to three spectacular national parks & easy access to New Zealand’s best fly fishing experiences. Booking subject to availability. Not transferable. Valid dates: 1-30th April 2019, 15th October to 30th November 2019, 1-30th April 2020. The exceptional innovative design of Hanak hooks increases the efficiency of strike and landing of fish. 10 packets of Hanak Competition Barbless Hooks – winners choice of style and size. Extremely fast line retrieval, completely sealed drag & enhanced, rugged durability. Choose preferred size and colour from Black Nickel or Silver. 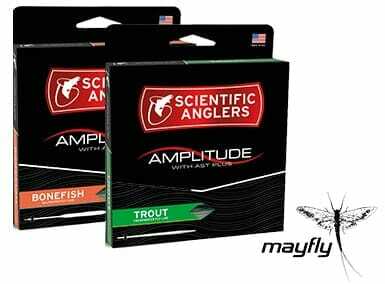 Featuring the revolutionary AST PLUS slickness additive, the Amplitude series will shoot farther and last longer. Amateur and professional photographers can enter. You may enter as many times as you like, however, only one of your shots can be selected as a finalist so select your entries with care. This is a competition of skill, not chance, so entering many times does not increase your chance of winning, it’s all about selecting your absolute best. All you need to do is fill out an Entry Form for each entry, attach your photo and accompanying details, and agree to the Rules and Conditions of the competition. It’s that easy. Our expert judging panel will select six finalists, from all entries received. The finalists will be announced via social media on Thursday 28th of February 2019. 1st, 2nd and 3rd prize will be selected from the 6 finalists by the judges and FlyLife Magazine team. Winners will also be announced via social media on Saturday 2nd March 2019. Prize winners will be notified directly. 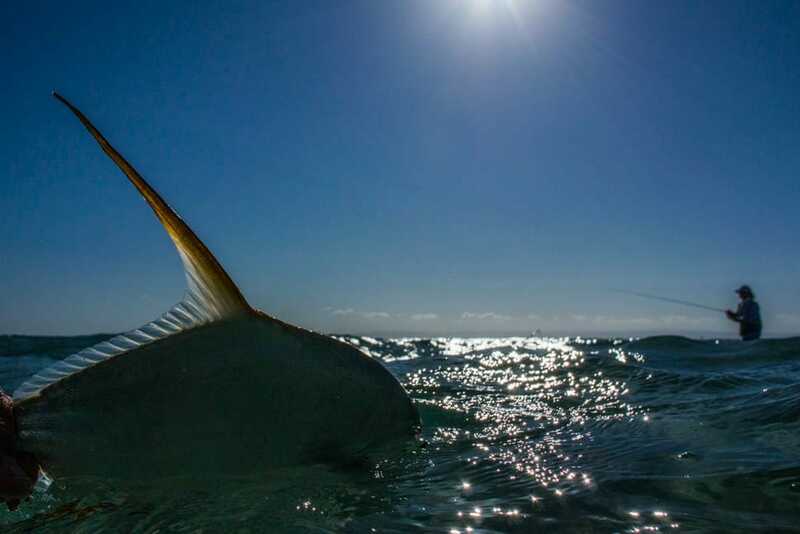 If you are looking for some tips on how to shoot great fly fishing photos, be sure to check out Brad Harris’ Better Fishing Photography article. Our experienced judging panel are experienced photographers and fly fishers in their own right and are regular contributors to Flylife. Click on the judges’ names below to view their profiles and top photography tips. David Anderson’s music photography career has spanned nearly thirty years; from local pub bands to touring with the Rolling Stones and has shot dozens of record covers and tour posters. He’s worked for most mainstream Australian magazines and newspapers and many more from around the world. In portrait photography he’s posed up a huge collection of film stars, rock stars, pop princesses, divas, boy bands, super-models, not-so-super models, legends, wannabes and even the Queen. 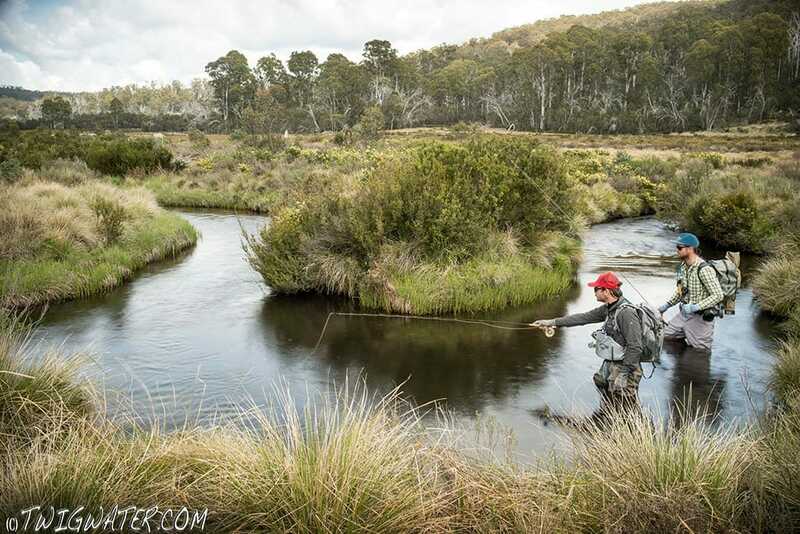 In fly fishing photography he has been a regular Flylife contributor since near the magazines start with numerous feature articles and six front covers. My mother and dad taught me to cast a fly when I was a boy and I grew up fishing the mountain streams of northern Pennsylvania. Both were very good fly fishers, my mother usually being the one who caught the most or the biggest. She can still cast a fly at the age of 90, and the last thing my dad did before he died at 88 was to go on his annual fishing trip in the Yellowstone region of Montana. You would think with a pedigree like that I would be an expert, but I have always approached fishing the same way that I have photography – unscientifically, enthusiastically and for the most part intuitively. Despite almost 60 years of tramping up streams I still don’t know much about the habits of trout or the life cycles of insects, I don’t tie my own flies, I only know about three knots, and I have used the same 7’9” 5-weight Orvis rod since sometime in the 1980s. But as in photography, it’s all about reading the scene in front of you. It doesn’t much matter what camera you use, and anyway it’s not the camera that takes the picture. Professionally I have been a freelance writer/photographer for 40 years. I’ve produced several books of my own, contributed to dozens of others and worked for a variety of magazines around the world, including Australian Geographic and FlyLife, to name a couple favorites. Between 2010 and 2016 I taught photography at Melbourne’s Photography Studies College, including four years in charge of the Advanced Diploma major in photojournalism. Currently I am developing a national training program for judges at the Australian Institute of Professional Photography’s annual Professional Photographer of the Year competition. One thing I have learned in a lifetime spent in pursuit of the perfect picture (whether as craftsman or critic) is that trophy photographs are no less elusive than trophy trout. Excellence is rare and the quest never ends. 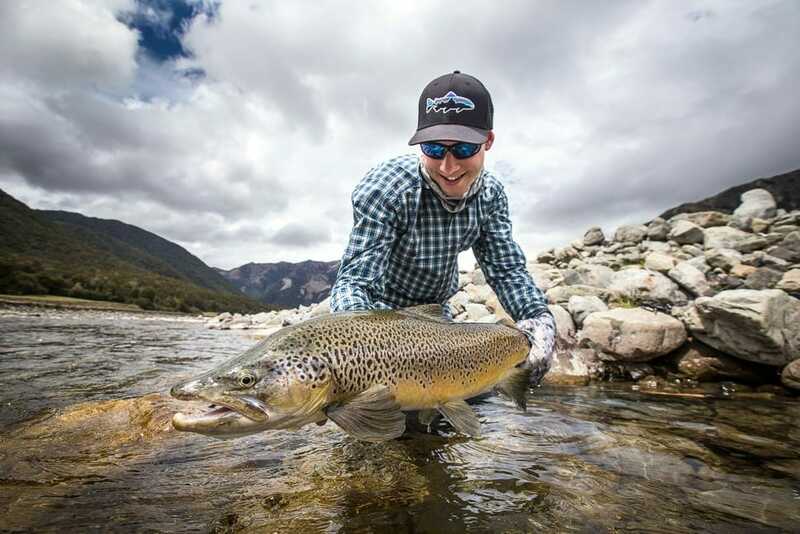 Brad Harris grew up in Cooma, NSW and learned to fly fish on the Snowy Mountain lakes and the blue-ribbon streams of the Monaro. This technical fishing background gave him a big head start when he moved to Tasmania 12 years ago. Brad has worked as a pro photographer since leaving high school and submitted his first article to FlyLife in Issue 17 (1999). He began part-time as the magazine’s staff-photographer for issue 42 (2005) and now works full-time for the magazine, taking care of pre-press duties, some graphic design and website content. He is relishing the chance to branch out into video work for the magazine and in his own sideline commercial photography business, BH Photo. Jess McGlothlin is happiest on the road in the gritty, far-off corners of the world. She sees her mission as a simple one: tell stories. Working as a freelance photographer and writer in the outdoor industry; while on assignment in the past years she’s learned how to throw spears at coconuts in French Polynesia, dodge saltwater crocodiles in Cuba, navigate uninvited sharks in Samoa, and document stand-up paddleboard first-descents on Peruvian Amazon tributaries. Based in southwestern Montana, she can usually be found trying to juggle a fly rod, a notebook, and a camera. 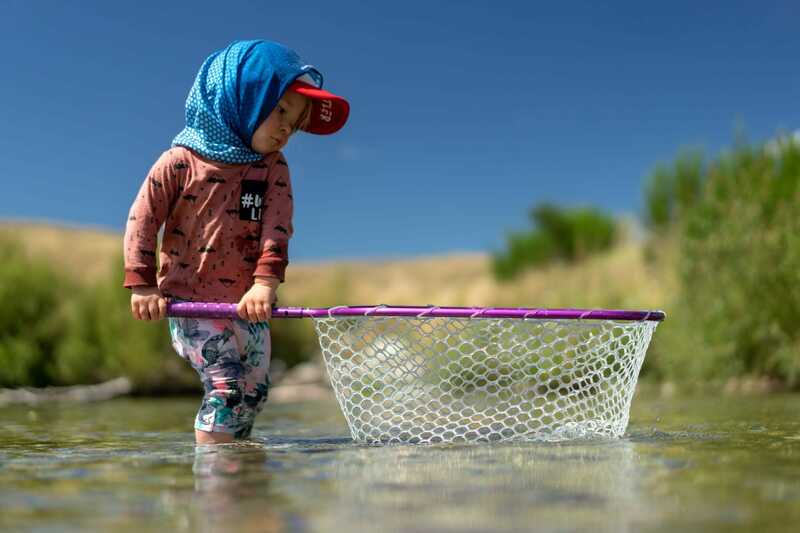 Lucky enough to start fly-fishing as soon as she could hold a rod, she spent an inordinate amount of time on the water as a toddler, a trend which has only continued as an adult. She’s worked in the fly-fishing industry around the United States and internationally, in capacities from lodge management to copywriter. As a freelance photographer, clients include Patagonia, Outside, Orvis, Costa Sunglasses, YETI, The New York Times,The Wall Street Journal and a host of other commercial and editorial enterprises. Subject coverage ranges from Western rodeos to fly fishing far above the Arctic Circle in Russia. 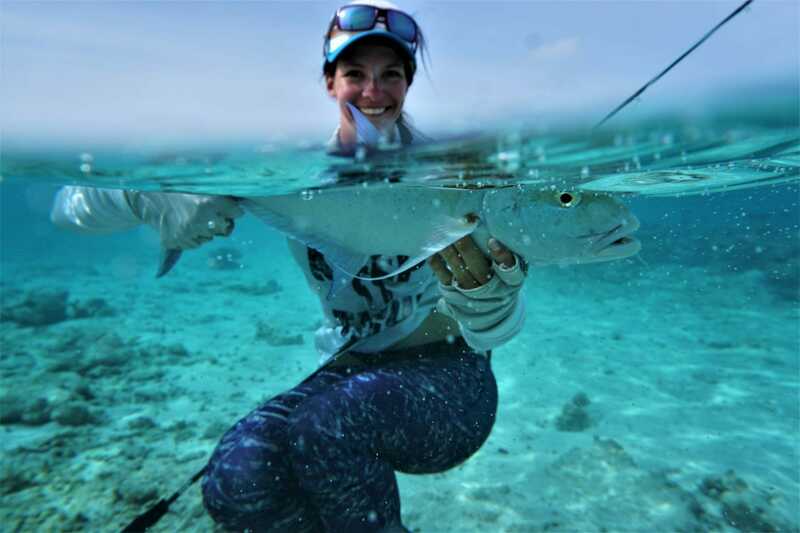 She has proven competence covering everything from international advertising campaigns to multi-day survival training sessions in remote, challenging environments to exploratory fishing trips. Her work has been featured in gallery shows in Russia, Germany, Israel and the States, and she has received international awards for both her writing and photography. Develop your own style. The end goal is for someone to be flipping through the latest fishing magazine, lay eyes on one of your images and immediately know who shot it. A distinct shooting style sets you apart from your peers — and it’s something editors and commercial clients will look for. I’ve gotten some jobs because of my style, and had clients turn me down for others for the same reason. Sometimes it’s a good fit, other times it’s not, and that’s okay. Your own style is a personal decision; don’t just copy how someone else shoots. Experiment, see what feels right, and make it your own. Take notes. So, you want to be a photographer… forget all that writing stuff. Okay. You should still pack a notebook and pen (or a phone with note-taking capabilities). Take notes — names, places, distances, fish habitat, funny phrases, quotes. Good, complete captions are key — editors will appreciate if you have the correct information, and plenty of it. Even if you’re just sharing images on social media with your friends, knowing the story behind the photos makes for much more engaging content. Just shoot. So, you’re not flying halfway around the world to cover an exotic fishery. Grab a friend and head to your neighborhood river. 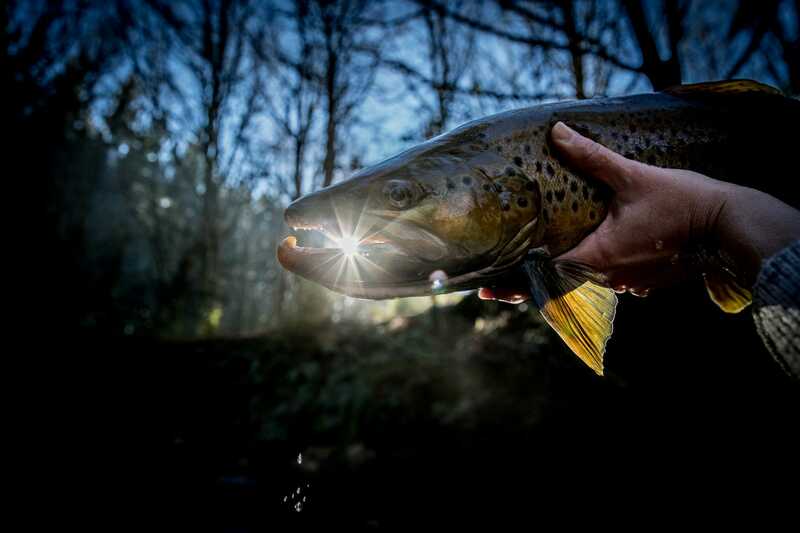 Play with light, play with fish, play with moving your feet and capturing different angles. Just play. Shoot subjects other than just fishing. You’ll be amazed at some of the images that you come away with. The image below was the result of just that — playing. While on assignment at Alaska’s Bristol Bay Lodge, I made friends with several of the guides, telling stories and sharing ideas for interesting photos over the week to come. 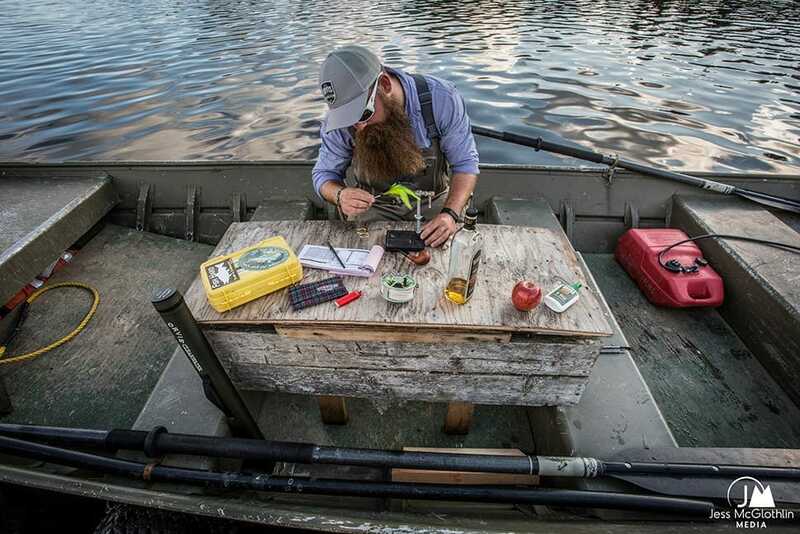 I left to photograph out-camps for a few days and when I arrived back at the lodge, the guys had created this “guide’s desk” in one of the boats, completely outfitted with accessories and a vise. We waited until soft, almost midnight light came around, then got into the boats, out on the lake and just played with it. Don’t be afraid to have a little fun — it usually pays off in your images. 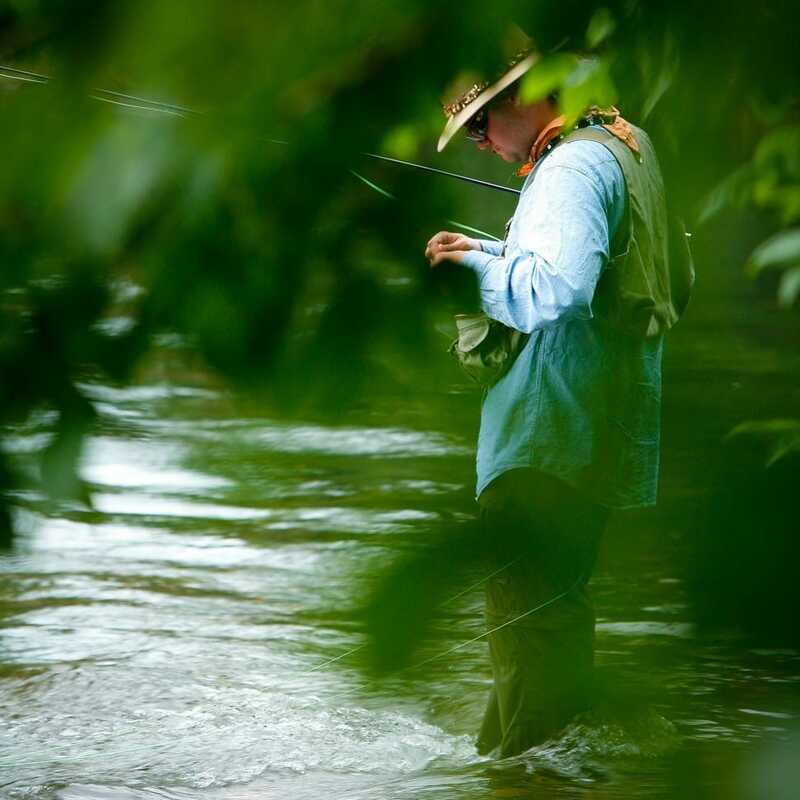 Peter has been writing on fly fishing since the mid-80’s. During the 90’s he had a very successful prime-time television series called Wildfish which ran for 26 episodes on a Tuesday evening at 8 pm. Peter does a lot of writing and photography, travelling the country talking to clubs and conducting casting days and fishing seminars. In 2009 he achieved his Federation of Fly Fishers Master Instructor certification, something he’s very proud of because of the rigorous exam that requires a broad and deep knowledge of the sport. 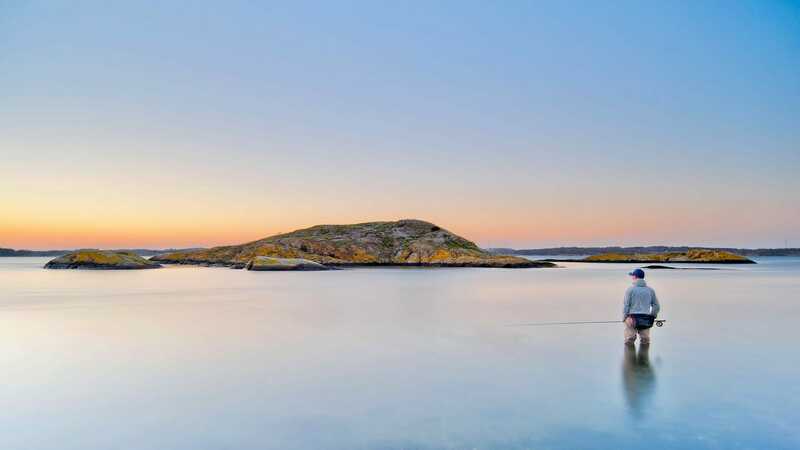 A regular contributor to FlyLife, Peter has written and photographed over 78 articles for the magazine and online and continues to educate fly fisherman on salt, estuary, fresh water fishing, casting and fly fishing technique. He is an international ambassador for Sage and RIO. The “Organisers” of the FlyLife Topshot Photo Competition 2019 are FlyLife Magazine Pty Ltd. The “Competition” is the FlyLife Topshot Photo Competition 2019 as defined in these Rules and Conditions. The “Sponsors” of the Competition are Mayfly Tackle, Stonefly Lodge New Zealand and FlyLife Magazine Pty Ltd. The Competition starts when publicly announced and ends 11:59pm AEST on Sunday 24th February 2019 (the Entry Deadline). FlyLife reserves the right to alter the Entry Deadline at its discretion during the competition. Employees and contractors of FlyLife Magazine, Competition Judges and their immediate family members (spouse, parent, child, sibling and their respective spouses), are not eligible to enter or win a prize. Entrants must be at least 18 years of age as of the date of entry, or have their parent or guardian’s explicit consent. All entrants must register online using the Entry Form at https://flylife.com.au/flylife-photo-competition-2019-entry to register. You may enter any number of entries but each entry must be submitted individually via the Entry Form. Entries will not be accepted via any other submission form such as email, postal mail or in person. Each Entry must consist of an entry form and a single image. Each submitted photograph, in its entirety, must be a single work of original material taken by the Competition entrant. By entering the Contest, entrant represents, acknowledges and warrants that he or she has full power and authority to enter the photograph, and that the photograph does not infringe any copyright or violate any other intellectual property rights. The entrant agrees to indemnify FlyLife Magazine Pty Ltd and its representatives, including judges, sponsors and affiliates, from any and all third party claims arising from the photograph entered. If the Photograph includes other people, you must obtain a signed, written Photographic Consent & Release Form from all persons who appear in the Photograph submitted, authorizing use of the Photograph as provided below in “Third Party Releases/Licenses.” If you are unable to provide a release, in the form provided by FlyLife Magazine, then your entry may be disqualified. The entries will be judged in accordance with the Judging criteria, as defined below. The photograph must not, in the sole and unfettered discretion of the FlyLife Magazine, contain obscene, provocative, defamatory, sexually explicit, or otherwise objectionable or inappropriate content. Photographs deemed inappropriate will be disqualified. Online entries must be made by the authorized account holder of the e-mail address submitted at the time of entry. “Authorized account holder” is defined as the natural person who is assigned to an e-mail address by an Internet access provider, online service provider, internet domain owner, or other person or organization (e.g., business, educational institution, etc.) that is responsible for assigning e-mail addresses for the domain associated with the submitted e-mail address. Prizes are specified on the competition page at http://flylife.com.au/flylife-photo-competition-2019. FlyLife reserves the right to substitute prizes other than those specified to the equivalent value at its discretion. Our expert judging panel will select six Finalists (the “Finalist”), from which 3 prizes winners will be chosen and announced via social media. Winners will be notified directly. 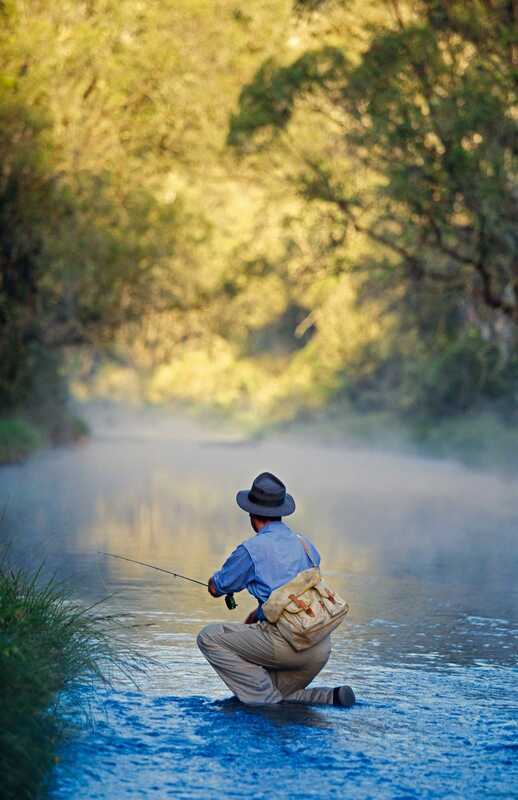 The criteria are subjective and will include composition, lighting, technical skill, along with the uniqueness of the overall photograph and relevance to fly fishing. Sponsors reserve the right not to award all prizes in the event an insufficient number of eligible entries meet the minimum judging, as determined by FlyLife Magazine and Judges in their sole discretion. The decision of the Judges and public Votes are final and binding. If a photograph entered contains any material or elements that are not owned by the entrant and/or which are subject to the rights of third parties, and/or if any persons appear in the photograph, the entrant is responsible for obtaining, prior to submission of the photograph, any and all releases and consents necessary to permit the exhibition and use of the photograph in the manner set forth in these Rules and Conditions without additional compensation. If any person appearing in any photograph is under the age of majority in their state/province/territory of residence the signature of a parent or legal guardian is required on each release. By participating, ALL ENTRANTS grant FlyLife Magazine Pty Ltd and their designees, licensees or affiliates (the “Authorized Parties”) a non-exclusive, worldwide license, through 31st January 2019, to reproduce, distribute, display and post the entries online so that viewers may view all Finalists and competing entries. In addition, each Finalist and Winners grant to the Authorized Parties a license for use of his/her entries in connection with the Competition and promotion of the Competition, in any media now or hereafter known, including but not limited to, print or digital publication in FlyLife Magazine showcasing the Winners; and promotions related to the Competition. Authorized Parties will not be required to pay any additional consideration or seek any additional approval in connection with such use. Winners and Finalists authorise FlyLife Magazine Pty Ltd to reproduce, distribute, display and create derivative works of the photograph entry in connection with the Competition, in any media now or hereafter known, including but not limited to: publication in FlyLife Magazine showcasing the Winners and Finalists; FlyLife website flylife.com.au; the Competition website and promotional sites; and in exhibits and promotions related to the Contest. Winners and Finalists authorize FlyLife Magazine Pty Ltd to reproduce, distribute, display and create derivative works of the photograph entry in connection with the promotion of the Contest for up to two (2) years from the announcement of Competition Winners. By participating, entrants agree to release, discharge and hold harmless FlyLife Magazine Pty Ltd, and each of their “Entities”, including but not limited to, respective sponsors, judges, partners, affiliates, subsidiaries, advertising agencies, agents and their employees, officers, directors, and representatives from any claims, losses, and damages arising out of their participation in this Competition or any Competition related activities and promotion and the acceptance and use, misuse, or possession of any prize awarded hereunder. FlyLife Magazine Pty Ltd and associated Entities assume no responsibility for any error, omission, interruption, deletion, defect, or delay in operation or transmission; communications line failure; theft or destruction of or unauthorized access to Competition entries or entry forms; or alteration of entries or entry forms. FlyLife Magazine Pty Ltd and associated Entities are not responsible for any problems with or technical malfunction of any telephone network or lines, computer online systems, servers or providers, computer equipment, software, failure of any e-mail entry to be received on account of technical problems or traffic congestion on the Internet or at any Web site, human errors of any kind, or any combination thereof, including any injury or damage to entrants or any other persons computers related to or resulting from participation, uploading or downloading of any materials related to this Competition. This Competition is subject to Australian federal, state, and local laws and regulations. Certain restrictions may apply. Entries are void if the FlyLife Magazine Pty Ltd determines the entry to not be an original, or if the entries are illegible, incomplete, damaged, irregular, altered, counterfeit, produced in error or obtained through fraud or theft. Entrants agree (a) to be bound by these Rules and Conditions; (b) that the decisions of the Judges and public Votes are final on all matters relating to the Competition; and (c) if he/she wins that FlyLife Magazine Pty Ltd and associated Entities may use each winner’s name, photograph, likeness, and/or voice in any publicity or advertising relating to the Competition or future promotions without compensation or approval. All federal, state and local taxes, fees and surcharges on prizes are the sole responsibility of the prize winners. In the event that the selected Winner(s) of any prize are/is ineligible or refuses the prize, the prize will be forfeited and FlyLife Magazine Pty Ltd, in their sole discretion, may choose whether to award the prize to another entrant. If for any reason the Competition is not capable of running as planned, due to infection by computer virus, bugs, worms, trojan horses, denial of service attacks, tampering, unauthorized intervention, fraud, technical failures, or any other causes beyond the control of organiser that corrupt or affect the administration, security, fairness, integrity, or proper conduct of this Competition, FlyLife Magazine Pty Ltd reserve the right, at their sole discretion, to disqualify any individual(s) who tamper with the entry process, and/or to cancel, terminate, modify, or suspend the Competition. If FlyLife Magazine Pty Ltd elect to cancel or terminate the Competition, any rights in the submitted photographs will not be retained.